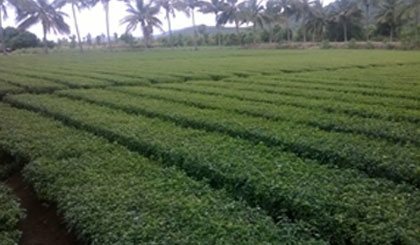 Unicorn is located in Hyderabad, Telangana which in the vicinity of lush tropical forests that are home to a wide variety of herbs, spices, medicinal plants and other valuable products. Our central location gives us the advantage to cultivate and source quality raw materials from all over India. 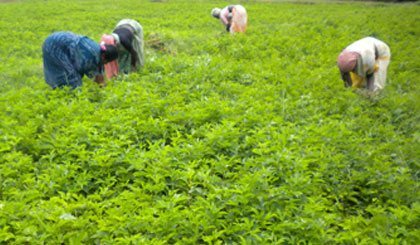 UNPL works closely with and has established partnerships with various NGO’s, farmers and farming cooperatives, collectors and local tribal folk for the cultivation, collection and sourcing of organic and conventional raw materials. Additionally, to ensure sustainable sourcing our team of agronomists and field experts work with our partners to promote good agricultural practices, and constantly shares with them the post-harvest best practices for cleaning, drying, sorting and storing the raw material. Sustainable and controlled sourcing is the first step to ensure traceability. Our sourcing team ensures diligent tracking and record keeping at the field level, where possible, and this meticulous approach is continued even once the raw material reaches our warehouse. Once the raw material is appropriately tagged, numbered and labelled it moves into production where we maintain batch manufacturing records that have detailed information for the identification of raw materials, solvents and excipients used at various stages. Our unique approach to vertical integration and commitment to transparency help us ensure complete traceability. Note: Level of traceability will vary from product to product. Unicorn’s manufacturing facility is spread across a vast campus in Genome Valley, Turkapally, Hyderabad. We are one among the few companies that have their own manufacturing facility for all our product lines. This gives us full control over our products and helps ensures the quality and standard of our products is maintained at all times. 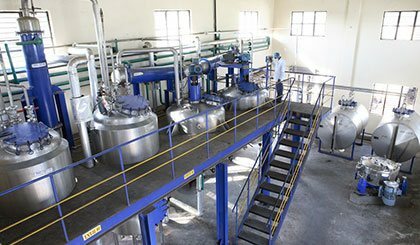 Our modern GMP Certified and HACCP compliant facility has a current production capacity is 12 Tonnes per day, spread across 5 independent extraction plants, which include equipment such as multi-purpose extractions vessels, condensers, centrifuges, steam and vacuum tray dryers, solvent storage tanks, cooling towers etc. Having 5 independent plants gives us the ability to process multiple products at any given time while reducing the risk of cross contamination. 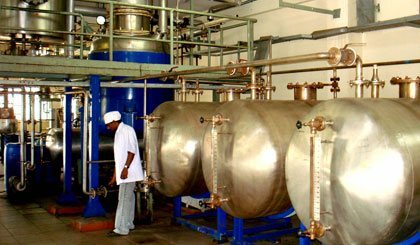 Other infrastructure includes solvent distillation units, spray drying units, falling film evaporators etc. There is also the facility of a clean room available for steam sterilization, if required. Additionally, there are various access controls in place to further ensure safety in the production process. Every batch of each product is tested for organoleptic properties, active components, contaminants and microbiological parameters, using up to date, industry standard testing methods, before it is passed by QC as fit to be sold. 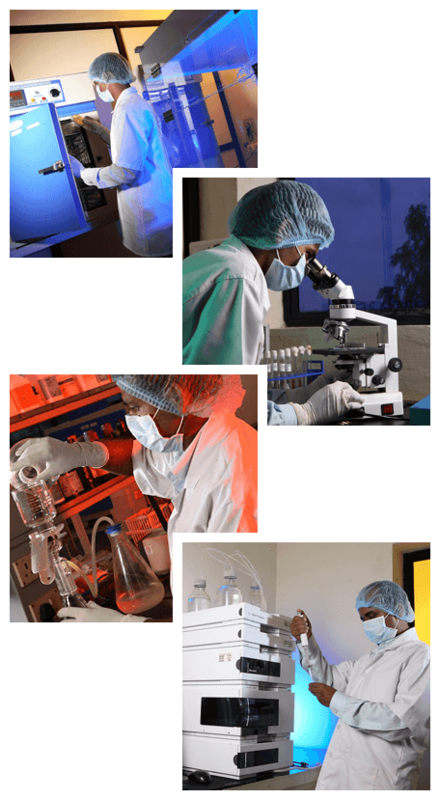 Our laboratories are equipped with state of the art instrumentation that is constantly upgraded to match and maintain international standards in terms of both, infrastructure and quality of products. These instruments include a pH meter, UV spectrometer, GC (Gas Chromatography), HPLC (High Performance Liquid Chromatography) and AAS (Atomic Absorption Spectroscopy) machines, a sonicator, and a nephelometer among several other standard equipment found in a QC laboratory. Every batch of each product manufactured is tested for its microbial load at our in-house microbiology laboratory. The lab is well equipped with the necessary equipment, such as autoclaves, incubators, microscopes, hot air ovens, glass distillation unit, petri plates etc. to test for the presence of any unwanted microorganisms at the requisite stages of the manufacturing process.